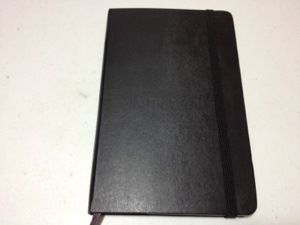 A little while ago I reviewed the Moleskine blank pocket book. 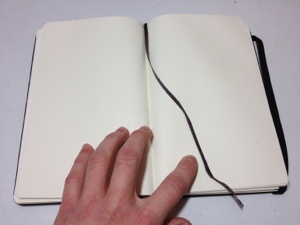 Now in the same notebook direction I’ll take a quick look at the Moleskine blank large book. Will the classic renowned Moleskine hold up to closer scrutiny? We’ll see. The cover is cardboard wrapped in faux-leather. It’s fairly sturdy, though it does begin to wear at the corners with continuous use. Though if you find a notebook that doesn’t I’ll be amazed. The binding is rounded, flexible and lies flat. It does have a tendency to crease when opened for too long. It also tears eventually, and if the book is really old it even begins to split down the back. This only happens toward the end of the book’s life (the last twenty pages or so). Around the cover is an elastic band which does a good job holding everything together but will eventually bend the cover in. The pages are super thin. There are 240 of them in this half-inch book. They are of okay stock. Anything heavier than a ballpoint pen bleeds through but not usually onto the next page, it can just be seen through the page. The paper is smooth and writes well, the fine texture is just enough to prevent slips of the hand. The first and last pages are attached to the binding, rendering them mostly useless. In the back is the standard pocket, which contains the story of Moleskine (and a quality control number which is actually quite useful). In the front is a ‘who owns this’ page with a reward blank. I don’t find those particularly useful but they are there. So are they worth it? Like all notebooks it depends on what you’re looking for (unless they just fall apart, those are useless no matter what). They are great for free range writing with sketches to enhance the look. As a sketchbook they work best with pencil as most anything else will bleed through. They are very solid in construction, the front cover especially can take a severe beating. They have very few organizational features, which some may find liberating and some infuriating. Like I said, best as a free range writing/sketch book. Alright as a travel log or such. They’re decent, and the ones I use all the time.